2) These Offer terms and conditions (“Offer Terms”) are in addition to the Amazon.in Conditions of Use & Sale and Privacy Notice to which you agree to by using Amazon.in; the terms and conditions of APay Websites and the terms and conditions applicable for the Gift Cards (“Gift Card Terms”) issued by QwikCilver Solutions Private Limited (“QwikCilver”). In the event of any conflict between the Conditions of Use & Sale or the APay Websites and these Offer Terms, these Offer Terms will prevail, only for the purposes of this Offer. To the extent the Gift Card Terms are inconsistent with these Offer Terms; these Offer Terms will prevail with respect to the Offer only. 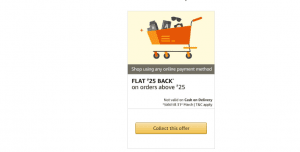 4) During the Offer Period, selected participants, who have collected the offer using the ‘collect offer’ button on the offer image, purchase any product(s) on Amazon.in using either a) Amazon Pay balance b) UPI c) Net Banking d) Debit Card c) Credit Card (each such order hereinafter referred to as “Order” and each such person hereinafter referred to as a “Purchaser”), will be entitled to receive a cashback of Rs. 25 per customer during the offer period. The maximum cashback per customers during the offer period will be limited to Rs. 25 only. 5) 5.”Amazon Pay Balance” is a sum of all the balances associated with Amazon.in Gift Cards issued by Qwikcilver (“Gift Cards”) in your Amazon.in account and all balances added as Money as Amazon pay balance issued by Amazon (“Money Balance”). Gift Cards are subject to the Amazon.in Gift Card Terms and Conditions available at www.amazon.in/gp/help/customer/display.html?nodeId=201522810. Money Balance is subject to the terms and conditions available at www.amazon.in/gp/help/customer/display.html?nodeId=202123460. 6) The Benefit will be provided to the Purchasers in the form of Gift Card(s). The use and redemption of the Gift Card(s) is governed by the Gift Card Terms. 7) Notwithstanding anything above, the customer can avail the offer for only one order and the benefit cannot be spread across multiple orders. 10) In the event the Order is returned by the Purchaser or cancelled by the Purchaser, seller or Amazon Seller Services Private Limited, for any reason whatsoever, the Order will not qualify for this Offer and the participation of the Purchaser will be deemed withdrawn. In the event the Order is cancelled in part, the Offer may be availed only on the net amount paid by the Purchaser basis eligibility. 11) Amazon reserves the right, at any time, without prior notice, without liability, and without assigning any reason whatsoever, to add/alter/modify/change or vary all of these Offer Terms or to replace, wholly or in part, this Offer by another offer, whether similar to this Offer or not. 12) Nothing contained herein amounts to a commitment by Amazon to conduct further, similar or other offers. 14) Under no circumstances, will the Benefit being offered under this Offer be settled in cash in lieu thereof by Amazon. 15) By participating in this Offer, every Purchaser expressly agrees that Amazon or any of its affiliates will not be liable or responsible for any loss or damage whatsoever that a Purchaser may suffer, directly or indirectly, in connection with this Offer, including but not limited to that associated with his/her use or delivery or misuse of any product purchased on Amazon.in. 16) The selected customers are not bound in any way to enroll/ participate in this Offer. Any participation is voluntary and the Offer is being made purely on a best effort basis. 17) Any person availing this Offer shall be deemed to have accepted these Offer Terms.